IFCI Ltd, the country’s oldest development finance institution, has come out with the second tranche of long-term infrastructure bonds for the current fiscal. These bonds will offer an additional deduction of up to ₹ 20,000 under section 80CCF of the Income-tax Act. Buy-back option: This option empowers an investor to tender the bonds back to the company and redeem their investment before the maturity. For 10-year bonds, the buy-back option would be available at the end of five and seven years. For 15-year bonds, the buy-back option can be exercised at the end of five and 10 years. The 10-year bond is offering an interest rate of 9.09%; the rate is 9.16% for the 15-year bond. So if you invest ₹ 20,000, your corpus would stand at ₹ 47,740 and ₹ 74,472 after 10 and 15 years, respectively. If you take into account the tax implication, the post-tax return in case of 10-year bonds works out to be 10.98% for those in the 30.9% tax bracket; 10.22% for those in the 20.6% tax bracket and 9.60% for the 10.30% tax bracket. In case of 15-year bonds, the post-tax returns would be 15.35%, 14.82% and 14.40% for those in the highest, middle and lowest tax brackets, respectively. IFCI bonds have been rated BWR AA– by Brickwork Ratings India Pvt. Ltd and CARE A+ by CARE Ratings (Credit Analysis and Research Ltd). Rating agency ICRA Ltd has provided LA. The higher the rating, more secure is the bond. IFCI’s capital adequacy ratio at the end of September stood at 19.3%, much above the regulatory requirement. But since the firm focuses on infrastructure financing, a downturn in infrastructure sector can have an adverse impact on its finances. As returns on Public Provident Fund (PPF) are not taxable, PPF works out to be better option than infrastructure bonds over 15 years. At present, even five-year bank fixed deposits score over these bonds since most banks are offering a higher interest rate than what these bonds are offering. Go for infrastructure bonds only if you have exhausted your 80C limit of ₹ 1 lakh. IFCI bonds are offering a higher return compared with the other two infrastructure bonds—from IDFC Ltd and L&T Infrastructure Finance Co. Ltd—currently open for subscription. 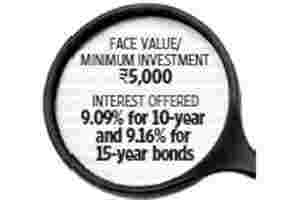 However, IFCI bonds have a lower rating that the other two and hence carry higher risk.